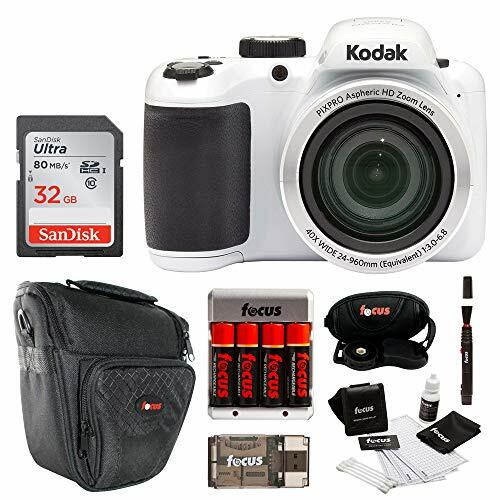 The Kodak Pixpro AZ401 digital camera is a part of the Astro Zoom Kodak Collection and features a fabualous 40x ultra long zoom lens with optical image stabilization delivers crisp, clear 16 megapixel close-ups, 180 degree panorama or HD videos with the switch of a button. Object tracking, post-editing features and a host of powerful, yet intuitive settings make photography with this camera effortless, entertaining and frustration-free. You’ll get well defined, detailed images thanks to the AZ401’s 16 million pixels. That’s ample resolution to crop, zoom, or enlarge your photos however the photographer in you desires. With a 24mm wide angle lens, there’s no sacrificing what you want in the frame. So go ahead and let your camera see what you see – the sky’s the limit! The Optical Image Stabilization will iron out any small movements as you’re focused on getting your shot, so you never have to be afraid to go for what you want. You know what you want out of a picture, and your camera should make sure that you’re able to get it. Whether you’re in the moment, or modifying your work at a later time, the bright, 3″ LCD screen ensures that you end up with just what you’re looking for. As far as the eye can see is now as far as the camera sees. In this mode, it’ll piece the picture together for you to produce one exquisite perspective. Capture everything in your peripherals with the 180° Panorama feature. Let the powerful 40x optical zoom lens get you the shot you need. If you’re not feeling brave enough to get up close and personal, nobody needs to know. Just stand back and admire while zooming in, and expect clear, crisp results with the PixPro!